The last official event of the Whitney Retrospective of Alice Guy Blaché’s work was a screening of her masterpiece La Vie du Christ (Gaumont, 1906) at the Brooklyn Museum on Saturday, December 5, 2009, 5:30-6:30 pm. The film and the panel following the film was presented in conjunction with the exhibition James Tissot: The Life of Christ (October 23, 2009-January 2010), organized by Judith F. Dolkart and made possible in part with support from the National Endowment for the Arts. 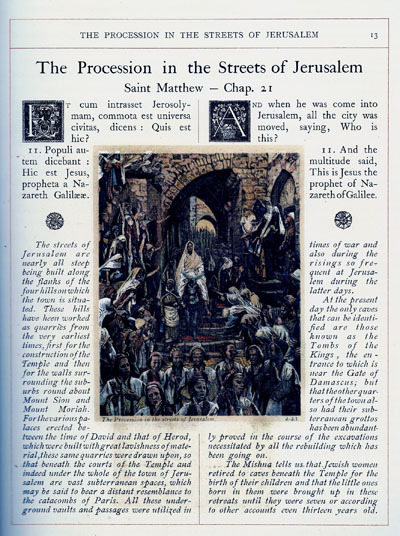 Alice Guy based the twenty-five sets and costumes for her silent film epic La Vie du Christ (The Life of Christ) on illustrations from Tissot’s watercolors published as the so-called Tissot Bible, a turn-of-the-century bestseller in England, France, and the US. The Brooklyn Museum exhibition, which closed at the end of January, around the same time the Whitney Retrospective ended, included 124 selected from the complete set of 350, as well as a copy of the Tissot Bible. The original watercolors were a pivotal acquisition of the Brooklyn Museum in 1900, the year Alice Guy herself acquired a copy in Paris. This screening, a partnership between the Whitney and the Brooklyn Museum, gave visitors a chance to compare the mediums of painting (and its translation into printed images) and film as related narrative forms. After the screening there was a discussion comparing and contrasting the points of view of filmmaker and painter, led by Judith F. Dolkart, Associate Curator, European Art, Brooklyn Museum, and curator of the Tissot exhibition; Catherine Morris, Curator, Elizabeth A. Sackler Center for Feminist Art, Brooklyn Museum; Joan Simon, Whitney Museum curator-at-large, organizer of the Alice Guy Blaché exhibition, and including myself. Most of the discussion focused on how Alice Guy changed the point-of-view in her film scenes from the way Tissot had shown them. For example, she did not show us Christ’s point of view once he was up on the cross. She also reversed angles from those Tissot had chosen, and often used architectural details from one scene (“The Tower of Siloam”) in a completely different scene, (“The Nativity”). However many images, such as Christ’s Resurrection, Christ giving a sermon at the Last Supper, and the scene where Mary Magdalene anoints Christ’s feet are very close matches. I have written extensively about La Vie du Christ in an earlier blog, which also contains images from the film. Although the Tissot exhibit is now closed, you can still see many images on the website, including images from Tissot’s sketchbook. The catalogue, edited by Judith F. Dolkart, has marvelous reproductions of all 350 watercolors as well as some photographs and several articles. Although the retrospective is over, this blog is not. I will continue to write about elements of the retrospective, especially the music, starting with an interview with Ben Model who played piano for this and several other Alice Guy events, and articles on the new music composed for a selection of the films in the retrospective. And of course I will continue to report on new Alice Guy findings and research and related items of interest.